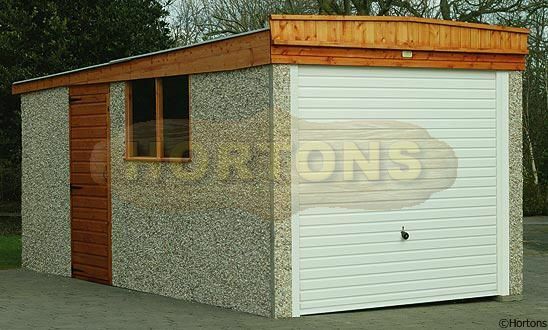 Our most popular and best selling garage range that provides the customer with a quality fit for purpose building at a truly remarkable price. Rearward sloping roof clad with Eternit fibre cement asbestos free (non-combustible) sheets secured with rust proof fixings onto primed fabricated angle iron roof trusses. Market leading Hormann fully retractable steel framed metal up and over door; pre-finished in white powder coating that requires little or no maintenance. Factory manufactured woodwork all pretreated before delivery which requires minimal attention to retain its pleasing appearance. Note Lidget Concrete™ attention to detail, with the attractive ship lap facia fan above the door and a complimentary timber window if required. As with all Lidget Concrete products these buildings are designed and constructed without compromise using only quality materials then expertly assembled to give exceptional value for money.